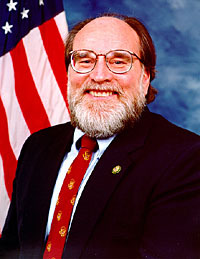 Teacher and state legislator elected to Congress in 1986, succeeding Cecil Heftel, who resigned his Congressional seat to run for Governor of Hawaii. Lost re-election bid in the same year and succeeded in Congress by Patricia Saiki, but returned to office in 1990, succeeding Saiki. Progressive Democrat; generally pro-abortion rights, pro-gun control. Opposed 1991 Gulf War resolution, 1993 North American Free Trade Agreement (NAFTA), 1998-99 Clinton impeachment, 2002 Iraq War resolution; abstained on 2001 USA PATRIOT Act; supported 2008 GM/Chrysler bailout, 2008 Wall Street bailout, 2009 economic stimulus. Resigned Congressional seat in 2010 to run for Governor of Hawaii, and succeeded in Congress by Charles K. Djou. Elected Governor in 2010, succeeding term-limited Linda Lingle. Long-time friend of President Barack Obama's parents.